The study of parasitic organisms at the molecular level has yielded fascinating new insights of great medical, social, and economical importance, and has pointed the way for the treatment and prevention of the diseases they cause. Biochemistry and Molecular Biology of Parasites presents an up-to-date account of this modern scientific discipline in a manner that allows and encourages the reader to place the biochemistry and molecular biology of these organisms in their biological context. The chapters are cross-referenced and grouped in an arrangement that provides a fully integrated whole, and permits the reader to create a composite of the biochemical function of these organisms. Individual chapter includes those devoted to metabolism, in both aerobic and anaerobic protozoa; antioxidant mechanisms; parasite surfaces; organelles; invasion mechanisms; and chemotherapy. The helminths are discussed not only from the point of view of their cellular biochemistry and metabolism, but also with respect to both their integrated functions such as neurochemistry, structure and functions of surfaces, and reproduction. 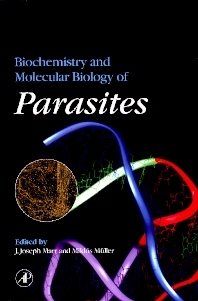 Written by expert investigators, this book will be of interest to all experienced researchers, graduate students, and to the newcomer eager to become familiar with the biochemistry and molecular biology of parasites. Senior undergraduates, postgraduates, and researchers in parasitology, tropical medicine, infectious disease, molecular biology, biochemistry, pharmacology, cell biology, and veterinary biology. E. Ullu and T. Nilsen, Molecular Biology of Protozoan and Helminth Parasites. F.R. Opperdoes, Carbohydrate and Energy Metabolism in Aerobic Protozoa. G.H. Coombs and M. Muller, Energy Metabolism in Anaerobic Protozoa. R. Komuniecki and B.G. Harris, Carbohydrate and Energy Metabolism in Helminths. M.J. North and B.C. Lockwood, Amino Acid and Protein Metabolism. R.L. Berens, E.C. Krug, and J.J. Marr, Purine and Pyrimidine Metabolism. C.J. Bacchi and N. Yarlett, Polyamine Metabolism. W.R. Fish, Lipid and Membrane Metabolism of the Malaria Parasite and the African Trypanosome. J.W. Tracy and E.A. Vande Waa, Xenobiotic Metabolism. S.J. Turco, Surface Constituents of Kinetoplastid Parasites. D.P. Thompson and T.G. Geary, The Structure and Function of Helminth Surfaces. M. Parsons, Protozoan Cell Organelles. R.E. Davis and A.O.W. Stretton, Neurotransmitters of Helminths. H.R. Gamble, R.H. Fetterer, and J.F. Urban, Reproduction and Development of Helminths. J.F. Dubremetz and J.H. McKerrow, Invasion Mechanisms. J.J. Marr and B. Ullman, Concepts of Chemotherapy. Subject Index. Dr. J. J. Marr has held positions in academic medicine and biochemistry; as Director of Divisions of Infectious Diseases; Vice Chairman, Department of Medicine; and Professor of Medicine, Biochemistry and Microbiology at Washington University, St. Louis University and the University of Colorado. Subsequently, he was Senior Vice Presidnt for Drug Discovery at Searle Pharmaceuticals, acted as a consultant to the National Institutes of Health and the World Health Organization, and now holds the position of Vice President for Research and Development/Chief Scientific Officer, Ribozyme Pharmaceuticals, Inc.
Biomed LLC, Estes Park, Colorado, U.S.A.
Dr. M. Muller has held academic positions at the Medical University of Budapest, the Rockefeller University and the Carlsberg Laboratories in Copenhagen. He is a past President of the Society of Protozoologists, Founding Editor of Molecular and Biochemical Parasitology, and now heads the Rockefeller University Laboratory of Biochemical Parasitology. He has also acted as a consultant to the National Institutes of Health, the World Health Organization and to the Center for Disease Control. The Rockefeller University, New York, U.S.A.